I’m a big fan of gin. Some may regard pasta and milk as essential household items, but my house feels empty without a bottle or two of gin in it. Recently I’ve been playing around with different styles and dipped my toes into the world of aged gins and genevers (Dutch gins). So when the chance came up to taste some of Zuidam’s finest aged genevers, and their whiskies, I got rather excited. Zuidam Distillers was founded by Fred van Zuidam in 1975 in the Netherlands. Fred was previously the master distiller for one of the biggest liqueur producers in the world and decided he wanted to have a go at it himself. He bought a small piece of land in Baarle-Nassau in the southern Netherlands and set up a small distillery of 300 sqm with the one small copper still and one production line. Fred was of the opinion that the liquid he produced was the most important part, and that the appearance of the bottle would make no difference to people’s opinion of his product. With this in mind, he used the same €0.25 bottle for every product he made. Apparently this bottle wasn’t particularly popular, and his wife Helene stepped in and took over creating their packaging. Since then, business has grown continually and they have gained a reputation for being one of the finest distilleries in the Netherlands – they now use over 360 different bottle designs to showcase their range. After studying at university, Fred’s sons Patrick and Gilbert joined the business. At this point, they were still quite a small producer, predominantly making liqueurs which were declining in popularity at the time. Patrick noticed how popular whisky and genever was in Netherlands, and decided they should focus their attentions on them. Gilbert doesn’t like whisky, but loves rum, so they also started making rum as well. To create a truly Dutch feel, they do something special with their grain. With the Netherlands being full of windmills it seemed only fitting that they should use them to mill their grain. The owner of a nearby windmill likes genever, so they instantly had a good trading tool to be able to use his mill. Nowadays they have their grain milled across nine windmills, although these are only open on weekends and are run by volunteers, which makes it quite tricky to get the grain to them and the milled grist back. Patrick did note that the peated malt isn’t milled in the same way, as it came in the wrong size bags. Patrick was also particularly pleased with his yeast choices. Typically most people use M-strain distiller’s yeasts, but Patrick mixes this with a brewer’s yeast used in Belgium dark beers. This type of yeast is not that effective on its own, as it is rather hard to gain a high enough alcohol level, but mixed with the M-strain it provides a fruity character that you wouldn’t normally get when just using distiller’s yeast. On that note, I think it’s time to move on to the whisky. Nose: Lots of banana and pineapple, slightly earthy with a hard-cheese-rind character. A touch of fresh bread and vanilla in there, too. Palate: Clean, young and vibrant. This is really fruity with that banana and pineapple dominating, but again the cheese rind and vanilla are coming through. For such a young whisky it’s actually quite creamy. It starts a little spirity but softens quite quickly and develops a crème brûlée character which is rather pleasant. Finish: Clean creamy and very rounded. Comment: This has great balance for such a young malt. Aged in virgin American oak and American refill casks, it’s fresh, zippy and packed full of fruit. Those yeasts seem to be working! Nose: Rich, quite woody at first but softens to reveal dried fruit, lots of black and forest fruits, a hint of dried coffee and a slightly floral character. 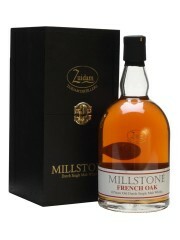 Palate: Seriously fruity nose here – the French oak, typically used for wine, is really doing its part. Although it’s quite light on the palate there’s a lot black fruit, particularly blackberries coming through. Finish: Light, clean, a little short in length as the tannins kick in towards the end. Comment: The French oak really sings through in this one and makes a huge difference to the whisky. Lovely and fruity, quite soft and very easy drinking. This little gem is Patrick’s favourite. 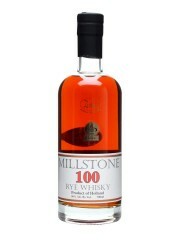 It’s aged in refill American oak for eight years, then moved into 250l Oloroso sherry casks to finish its maturation. Many producers have sherry casks made especially for them. The bodegas will typically ‘season’ these casks by putting sherry into them for less than a year. This sherry often gets turned into vinegar or brandy de Jerez and the barrels get sent on to the distillery. Patrick, however, uses old sherry casks that have been used in their solera systems, often for decades. I’m excited to see how noticeable a difference this will make. Nose: Wow – this is packed full of fruit and chocolate. A ton of dark chocolate, stewed cherries, just the tiniest hint of acetone, loads of dried fruit and a winter-berry fruit compote. After a while it opens out further and forest fruits, sweet spices, raisins and orange peel come into play. Palate: Rich, oily, with dark chocolate and forest fruits taking centre stage. There’s an initial hit of alcohol which slowly softens in the mouth. Some white pepper, cloves, raisins and more dried fruit develop after a few sips. Finish: Really chocolatey, rich, creamy and rather delicious! Comment: Great flavour, full of intensity. Takes a little while to open up and soften, but it’s well worth the wait so that the chocolate and forest-fruit character can show. This whisky has been aged in the same way as the previous one, however instead of Oloroso casks, it has gone into a PX (Pedro Ximenez) cask. 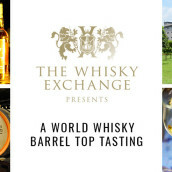 Unlike Oloroso, which is a dry sherry, PX is seriously sweet — typically, they have 500-600g of sugar per litre. It’s practically treacle, but delicious drizzled on ice cream. Nose: Orange zest, dried fruit, celery bitters, raisins and chocolate resonate. There’s a surprising freshness, which I rarely find in PX finishes. Palate: Oily, dark chocolate, dried fruit, raisins and mouth coating, with a slight vegetal note coming though. Finish: Clean, chocolatey and a little bit creamy, but surprisingly fresher than the Oloroso cask. Comments: I’m torn between these last two whiskies. 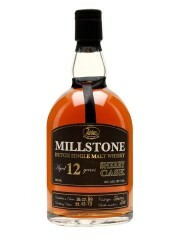 I really like this one but I think the Oloroso cask just gives a little bit more. 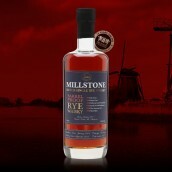 I love rye whisky. That spicy, slightly sweet character is just a winning formula for me, so needless to say I was looking forward to trying this one. Rye is not the easiest material to work with; it becomes seriously thick when it’s mashed, almost like wallpaper paste, and can be quite lively, too — if the fermenter isn’t the perfect temperature, it can easily boil over and break out on to the floor. It also produces quite low yields. If they’re lucky, Zuidam will get 320ml of alcohol per 1kg of rye grain, about there quarters of the amount that most Scottish distillers would get from their malt. 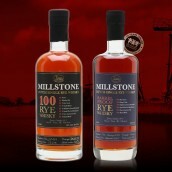 Unlike many of the American ryes that only require a minimum of 51% rye, Patrick uses a 100% rye mash bill, with a 50:50 blend of unmalted and malted grain. He also distills in pot stills rather than a column still to give the spirit more character. Nose: Vanilla, wood polish, honey, crème brûlée, vanilla ice cream, iced coffee, and a hint of freshly made Christmas cake. This one doesn’t have that spicy, vegetal character than many of the American versions have. Palate: Toffee, caramel, honey, vanilla, cream, iced coffee, sweet spices and dark chocolate. It’s a little spirity, but that’s not surprising given that it’s 50% abv. Finish: There’s a taste of apple and mushroom being cooked on the finish. It’s rather pleasant. Comment: Quite different from many of the ryes that I’ve previously tried, but absolutely delicious. After that wide-ranging selection of whiskies, it was time to move onto the genevers. Gin is a hugely growing category and there’s a fabulous selection available at the moment. Although technically similar, genever is quite different to gin in flavour and is drunk in a very different way, often served straight up in many parts of the Netherlands. A quick rundown on production: take some spirit, add botanicals, redistill it — gin or genever. While that’s a simple overview, each of Zuidam’s genevers takes that idea and then does something different with it. Patrick redistills half of his 5 year old rogge in the presence of the botanicals, then after a brief resting and marrying period with the other half, he bottles it. He feels that while the rye needs ageing, the botanicals do not. Nose: Seriously vegetal, there are cabbage, celery and slightly floral notes. Palate: Floral, creamy and a hint of sweetness — this doesn’t have the bitterness that you get from many gins. There’s some fresh root liquorice, vegetal and juniper notes in there too. Finish: Clean and creamy with that juniper kicking in towards the finish. Comment: I think this one confused me a little. I wrote, ‘neither a gin nor a whisky’. It had all those floral characters that you get from gin but packed full of body, too — not something I’m used to drinking and I’m a little lost as to when I would drink this, but I really like it nonetheless. Patrick’s ‘super secret’ recipe (don’t tell anyone this, ever, please) for his genevers is a mix of one third rye, one third corn and one third malted barley, and he ages this genever in oak barrels for a year. Nose: Floral, blossom notes. Quite light and delicate. Palate: Hint of sweetness, creamy, floral, slight juniper note although I felt like I was searching for this one. A little grapey and herbaceous, too. Finish: Oily, grapey, sweet on the tongue and just a little spirity. Comments: I’m new to aged genevers but I’m growing to like them. As an aperitif, this is delicate but really fresh and vibrant. 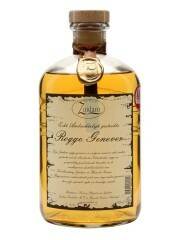 There are two main types of genever, oude and jonge, or in English, old and young. 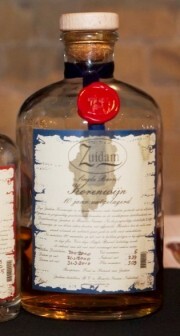 This is not a indication of ageing but of distilling technique: in simple terms, oude refers to the ‘old’ style of genever and jonge is the more modern style. The main differences are that jonge genever must contain no more than 15% malt wine, the strongly flavoured spirit that gives genever it’s heavier character than gin, and 10g of sugar per litre, whereas Oude genever must have at least 15% malt wine and no more that 20g of sugar per litre. The rest of the the blend is neutral grain spirit, which means that jonge genevers tend to be lighter and almost neutral in taste, and more akin to a vodka, whereas oude genevers are smoother and more aromatic. 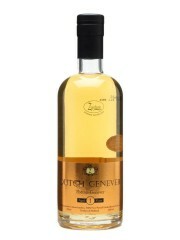 For this particular genever, Patrick brings his base spirit down to 45% before ageing rather than before bottling. Although this means he requires quite a few more barrels to age the spirit in, he feels that this helps to show the botanicals better once bottled. Nose: Light, floral, coconut, slightly milky and juniper showing here. Palate: Mouth coaxingly creamy and smooth, herbaceous, floral, lots of juniper and that milky character showing again. Finish: Really herbaceous and quite clean. Comments: Again I’m a little lost as to when I would drink this, but I guess that’s what happens when you try something completely new. This is packed full of flavour again and both malty and herbaceous. The more I think about it, I can begin to picture myself sipping a few of these while sat out in the sun in my garden. So we’ve learned the difference between oude and jonge genever. Now, let’s throw another style into the mix. 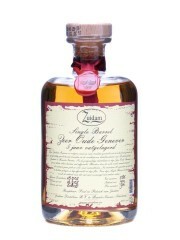 Korenwijn (grain wine) is like an older style of genever dating from the 18th century. These are usually aged in oak casks for a long period and contain 51-70% malt wine. This example is distilled four times, rather than three times which the previous three styles undergo. He still uses his ‘secret’ recipe for this one though. Nose: Caramel, toffee, forest fruits, hint of spice. Palate: Sweet on the tongue, and really fruity. Lots of forest fruits, black fruits, black cherry, vanilla, honey and really creamy. Finish: Sweet finish here, creamy, buttery and seriously fruity. Comment: I had a slightly abstract conversation about genever with someone after this tasting, as I was trying to understand when this is typically drunk, given that it isn’t widely available in most places. We ended up talking about snakebite — it’s the kind of drink where you’re on one side of the fence or the other. Genever, and this korenwijn, are not necessarily an acquired taste like snakebite, but it’s something relatively new for most of us. That said, I think it’s definitely well worth embracing and something we need to drink more of. 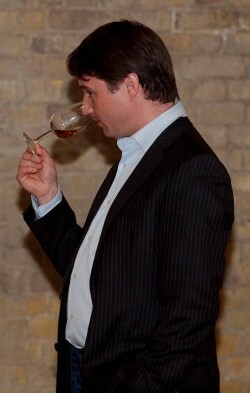 Our thanks go to Patrick van Zuidam for hosting such a great tasting, and too all of those who attended. 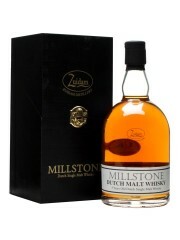 You can find Zuidam’s complete range of Millstone whiskies, genevers and liqueurs over on The Whisky Exchange website.